I just posted an update to this issue. It has been submitted as a Design Change Request to the System Center Product Group. OSD has been working fine. PXE booting is working without problems. I have previously deployed the Win7 image to a different hardware model without issues. In this instance we were needing to deploy to a new model. I imported the drivers into Configuration Manager and added a new “Apply Driver Package” step into the Task Sequence. I forgot to add the new driver package to a Distribution Point…so when I kicked off the new bare metal deployment to this unknown computer, it naturally failed at the “resolving selected task sequence dependencies” check. I quickly realized what I had overlooked and added the driver package to the DP (and ensured it was source version 2…I was surprised to see that this is STILL an issue.). When I attempted to PXE boot the computer again (the unknown computer that had JUST run the task sequence as an unknown) it failed with the “abortpxe.com” error message that typically means that there is no Task Sequence deployment applicable to this computer. When the task sequence starts for an unknown computer it creates a new computer object named “Unknown” in the “All Systems” collection. This computer object has the MAC address and BIOS ID of the previously unknown computer…except that it is now a Known computer…not an Unknown computer…although the System Resource “Unknown Computer” property is set to “1”. So…my deployment to “All Unknown” computers now fails. This is easy to resolve…simply delete the computer object named “Unknown” and restart the PXE process. But…at best this is an unexpected and undesirable result. PXE boot a computer that is unknown to Configuration Manager. Find the package that isn’t on a DP and distribute content to the DP (or simply remove it from the Task Sequence). In “All Systems” is a computer object named “Unknown” that has the MAC address of the system that was previously unknown. Because it is in the database, it is now a “known” computer…so deployments to “Unknown Computers” won’t pick up this computer any more. Note for Option 2: if the TS continues to fail, it will create a second/third/etc object with different resource IDs. Which collection are you referring to? the collection I referred to is the collection that the task sequence is deployed to…although this will be dependent on collection refresh of that collection, it’s limiting collection (and any other limiting collection until you get back to the all systems collection…which is where the unknown object will appear. quite simply…this is ugly and I wouldn’t recommend it…it simply will take too long for most people. Instead…go with the option of deleting the unknown object from the All Systems collection. I have this problem too. Deleting the record works fine but would like it to get automated. Unfortunately I don’t understand solution 2 provided here at all. Yes…that is the fix unfortunately. This has been put in as a design change request. We can at least HOPE that it makes it into SP1 which should come out reasonably soon…as Windows 8 support is a key component of SP1. Thank you for the reply. I guess I could create a SCO runscript that would delete all unknown computers every 1 hour or so untill SP1 is release. I dont think this is bug at all. 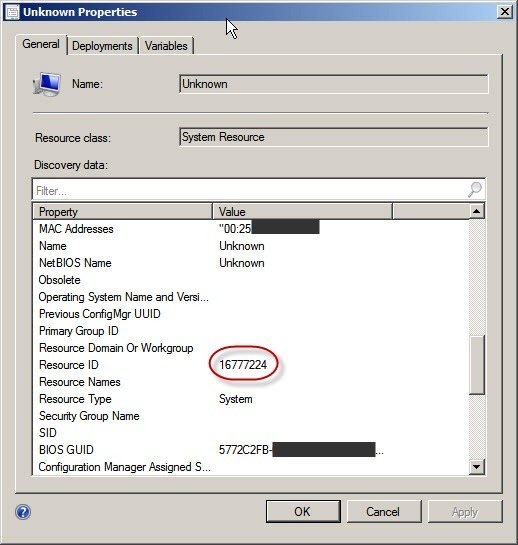 Sccm knows now computer, and object is named unknown. 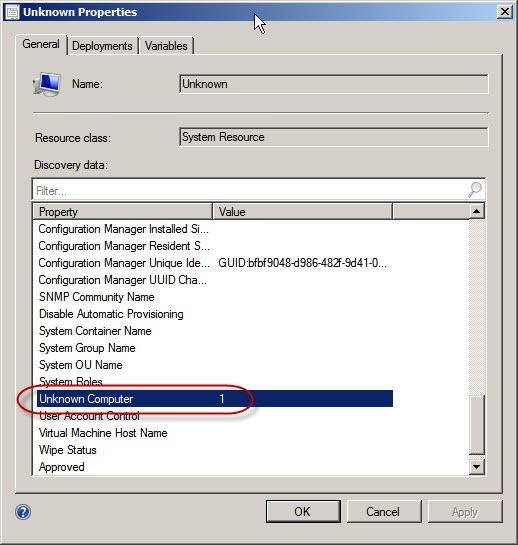 There is no need to delete unknown objects (may even crash active task sequences installations). Now deploy task sequence also to new collection. Thats all. Collection have some refresh delay, depending your collection and site settings. I agree that it is technically not a bug…see my follow up post that I mentioned at the top of the post. However…I do not think that this is a good design…hence the reason I submitted it as a Design Change Request. My issue is that this is not a manageable object, and as such it serves to break the normal process of deploying to unknown computers that has been around for a long time. The solution you mentioned is very similar to one of the two options I mentioned in the post. I agree that this will work, but the collection refresh delay does not make this a very desirable option in my opinion (and in the opinion of the clients that I have discussed this issue with). Do we know if this change request made it in SP1? I’m not sure. I did not see it listed in what is included in SP1, so I doubt it. I just deploy to “All Systems” and set it to “PXE and Media only”. Hi, i’m on a new install of sccm 2012 r2 which is only a month old and have come accross this problem today. i guess it wasn’t patched!! I also suffer from this problem. I have so far followed the same path as Niko L and created a collection with a query system resource “name” is equal to Unknown. This way i can monitor it and if neccesary deploy TS’s to these workstations. We are currently imaging a lot of machines atm and I am nervous of the fact some of these could be running task sequences.